WASHINGTON, DC -- U.S. intelligence officials presented reporters with their most detailed case yet Tuesday that Russian-backed Ukrainian separatists shot down a Malaysia Airlines jetliner last week, in a bid to counter what American officials see as Russian efforts to muddy the waters with claims of Ukrainian culpability. Experts check debris at the crash site of Malaysia Airlines Flight 17 Tuesday in Ukraine. The plane went down in an area of heavy fighting. 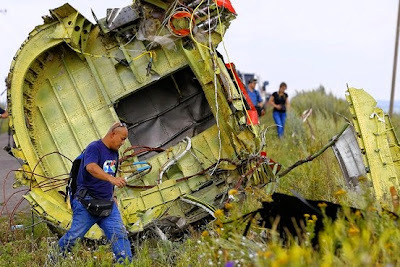 The officials relied on photographs, social media, voiceprint analysis and circumstantial evidence to make their public case that a likely SA-11 anti-aircraft weapon fired from separatist-controlled territory shot down the commercial airliner, killing 298 people on board. The evidence cited, however, didn't raise the case for Russian involvement in the shoot-down to a new level of certainty, indicating that much of the U.S. case remains circumstantial. Officials said they are still working to refine evidence and may offer more in coming days. Other U.S. officials, including some at the Pentagon, have said with more certainty in recent days that Russia likely provided the missile system used by separatists to shoot down Flight 17. The more restrained presentation by intelligence officials Tuesday reflected the cautious nature of intelligence analysis. There is a "solid case it was an SA-11 fired from Eastern Ukraine under conditions created by Russia," a top U.S. intelligence official said. The officials said that the U.S. detected a surface-to-air missile launch at the time that the airliner was hit, in roughly the same separatist-controlled area in Eastern Ukraine; that there has been a growing flow of weapons from Russia to separatists over the last month; that Russians have provided training for separatist fighters in southwest Russia on antiaircraft weapons and other arms; and that separatists have downed more than a dozen aircraft during the conflict. The officials further pointed to the separatists' efforts to control the crash site as evidence that the area is under their control. Among new findings, officials said that shrapnel damage to the Malaysian airliner visible in photographs is consistent with a surface-to-air missile, such as an SA-11. The officials also said they had corroborated some of the Ukrainian communications intercepts that Kiev has said show separatists discussing the shootdown, using voiceprint analysis by the National Security Agency and the Central Intelligence Agency. They added that they are still going through their own databases of intercepts to find corroborating evidence, and that doing so could take time. U.S. officials showed aerial photos of what they said was a training center in southwest Russia where separatists were taught to use air defense systems. The on-site investigation of the crash site is expected to provide more physical evidence of what happened to Flight 17. The Netherlands said Tuesday it would take the lead in that probe, but accident investigators on Tuesday still hadn't arrived at the crash site as fighting raged in the region. The remains of hundreds of victims were transported in five gray refrigerated train wagons from the rebel-held area in eastern Ukraine to the government-held city of Kharkiv, where they came under the custody of a multinational forensics team. The experts observed a moment of silence before transferring the first of them to a makeshift forensics complex at a tank factory. The bodies will be flown on Wednesday to Eindhoven, the Netherlands, and from there to a military base in Hilversum, southeast of Amsterdam, for identification. Russian President Vladimir Putin said in a speech Tuesday that Russia would attempt to influence separatists in eastern Ukraine to aid the investigation even as he slammed Western leaders for "destabilizing" the country. U.S. intelligence officials also provided a map, released earlier Tuesday by the State Department, that showed the trajectory of the fatal missile and the launch site where it was allegedly fired. They cited as possible evidence comments by the Russian ambassador to the United Nations in Tuesday that left open the possibility that the shoot-down could have been a mistake. The Russian government is making a "full-court press" to spread a Russian version of events that try to pin the shoot-down on the Ukrainians, which is "not plausible to us," one senior intelligence official said. A key goal of Tuesday's presentation, said one senior intelligence official was "not letting a Russian narrative get out there," said one senior U.S. intelligence official. Russia has continued its support to the separatists even since the crash of Flight 17, sending tanks and rocket launchers, U.S. intelligence officials said. "We don't think they have stopped," said one. "We think they continue to do it." The officials pointed repeatedly to social media to bolster their case, citing postings about sightings of an SA-11 traveling through the separatist-controlled towns of Torez and Snizhne, near the crash site and the location where officials believe the missile was shot from. The SA-11 has the range and altitude that would have been able to shoot down the Malaysian airliner from this area, they added. Intelligence officials presented as part of their case a map and accompanying photos, taken from social media, of an SA-11 system being moved through eastern Ukraine toward the Russian border in the aftermath of the crash. Another social media posting that showed an SA-11 apparently traveling back to Russia through the Krasnodon area is further evidence, they said, noting that they are still working to verify the location and direction identified in the video. The further cited the separatists bragging about a shootdown in social media postings, echoing earlier comments by U.S. leaders. The officials said they could not be certain when the SA-11 system was brought into eastern Ukraine. U.S. officials suspected that the Russian-backed separatists had an SA-11 when a Ukrainian military cargo plane was shot down at a lower altitude on July 14, but U.S. intelligence officials still have not confirmed that an SA-11 is what took it down. The July 17 crash of Flight 17 confirmed the presence of the SA-11, the officials said. Lawmakers have questioned why the U.S. didn't provide warning to airlines, and U.S. officials said that they didn't know until July 17 that the separatists had the capability to shoot aircraft above an altitude in the high 20,000-foot range. They noted that it can be difficult to track the transportation of weapons because they are often moved at night, and the Russians have provided the separatists with types of weapons that the Ukrainians also have in order to maintain "plausible deniability." While the Ukrainians also have SA-11s, the U.S. intelligence officials said Tuesday that that those weapons were nowhere near the site of the shootdown at the time. Further, the intelligence officials said it would not be credible to think Ukrainians would fight their way through separatist territory, fire a missile at a civilian airline, then fight their way back through separatist territory. They said the same of the Russian argument that a Ukrainian plane shot down the commercial airliner, pointing out that the damage to the airliner shows signs of being hit by a surface to air missile -- not one fired by another aircraft.